Gray's Inn prospers today as one of the four Inns of Court at the heart of legal London. Its connection to legal education dates back into the 14th century. Segar's List—a note of prominent Readers or Benchers made in the days of Charles II by Simon Segar, chief butler and Librarian of Gray's Inn—records three names from that time: William Skypwith 1355, John Markham 1391 and William Gascoigne 1398 [FN1] .Chronologically the fourth name on the list is Thomas Tildesley (1403) who was mentioned in a previous post and who died in 1410. The Admissions Register for Gray's Inn from 1521 to 1889 was transcribed and published by Joseph Foster. [FN5] It contains twelve members of the Tyldesley family listed below and numbered for ease of reference. Foster notes that "It was the practice of the Inn that each Treasurer, Bencher, or Reader, introducing a student or honorary member, should enter the admission himself in the Register". This no doubt explains the short explanation attached to entry 6, the admission of Edward Tyldesley. A rough notion of the size and surroundings of the Inn during the early days of Elizabeth may be gained from the map of Ralph Aggas, a portion of which is reproduced on another page. It is true that the date—1560—sometimes assigned to this map is impossible. Aggas, in that year, was not out of his teens ; moreover, he pictures St. Paul's Cathedral without the spire which it possessed down to 1561. But at whatever date his work was made public, his plan of Gray's Inn certainly does not show the buildings erected by Sir Edward Stanhope and others between 1570 and 1580, and it may be concluded that the survey on which it was based was taken, by Aggas or another, before the earlier of these dates. The map is hardly correct in regard to scale, and it does not very clearly indicate the Hall. It does, however, corroborate the conclusion to which the building orders in these records lead—that prior to the accession of Elizabeth the Inn consisted of buildings irregularly grouped round one court, afterwards known as Middle, or Chapel, Court, i.e., the southern portion of Gray's Inn Square. 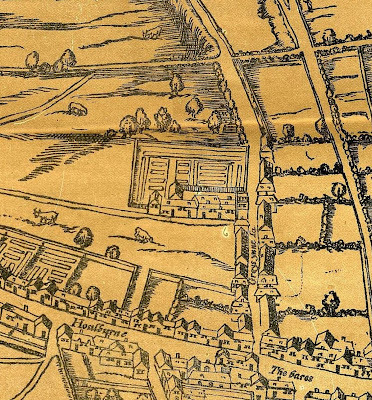 Aggas shows a line of houses, some of which would have formed part of the Society's premises, bordering Gray's Inn Lane from the Chapel to the corner of Holbom. But South Square is uninclosed on the west, and cows are feeding there. The only gateway is that which opens upon Gray's Inn Lane. North of the buildings there is the garden, afterwards the site of Coney Court, and beyond that the " Panyerman's close," which, together with a field to the west of the Inn, was eventually converted under Francis Bacon's auspices into the celebrated " Walks." The housing question was evidently in these days somewhat pressing. The members slept two in a chamber, and even then the Inn was too small to hold them. 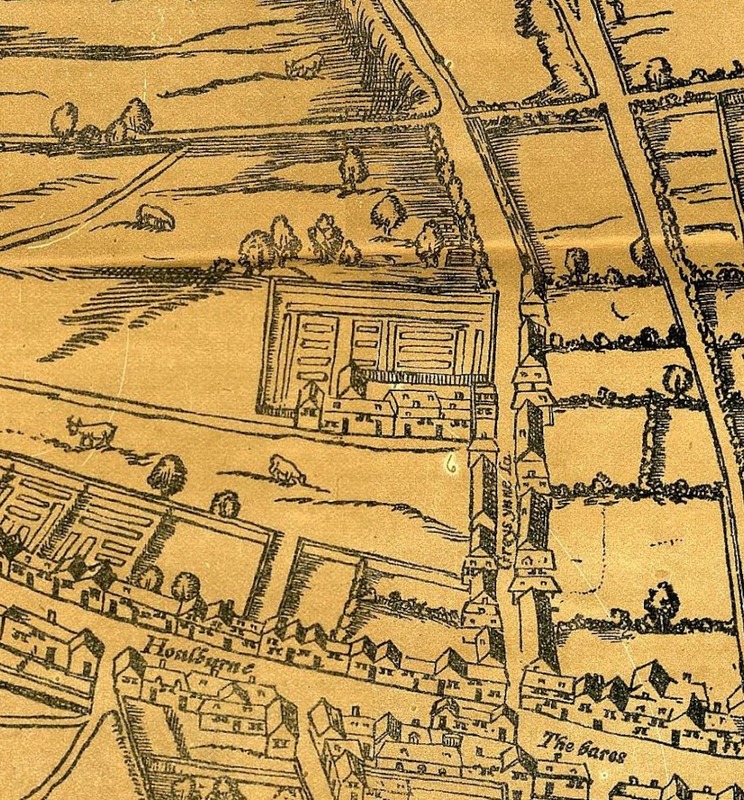 About 1556 Bentley's Rents' were built by private enterprise just outside the bounds "for the ease of the house, lodgings at that time beinge verry scant," and some buildings known as the Irish Rents, standing on the west of the strip of ground afterwards acquired for the entry into Holborn, were hired by the Society. But if there was close packing in the chambers, there was fresh air outside. The Inn stood practically in the country, open to the breezes of the Hampstead and Highgate hills, and was, in fact, famous then, and for a hundred and fifty years afterwards, for its healthfulness. 6. My thanks to the excellent MAPCO site where the full map is available.